A deep blue mineral, gem material, ornamental stone, ore of copper, and pigment. Azurite with Malachite Nodule: A specimen of nodular azurite sawn and polished to reveal its beautiful blue structures. A specimen like this would be a superb gem material or ornamental stone. Approximately 8.6 x 7.5 x 3.1 centimeters in size. From the Bisbee area of Cochise County, Arizona. Specimen and photo by Arkenstone / www.iRocks.com. Azurite is a copper carbonate hydroxide mineral with a chemical composition of Cu3(CO3)2(OH)2. It is best known for its characteristic deep blue to violet-blue color. The blue color, known as "azure," is like the deep blue evening skies often seen above deserts and winter landscapes. Azurite is not a common or abundant mineral, but it is beautiful and its blue color attracts attention. It has been used by people in many parts of the world for thousands of years. Ancient people used it as an ore of copper, as a pigment, as a gemstone, and as an ornamental stone. It is still used for all of these purposes today. Azurite and Chrysocolla: A slab of rock showing fractures filled with azurite and chrysocolla. Slab is about 8 centimeters long. Photographed wet to show full color. From near Bisbee, Arizona. Azurite is a secondary mineral that usually forms when carbon-dioxide-laden waters descend into the Earth and react with subsurface copper ores. The carbonic acid of these waters dissolves small amounts of copper from the ore. The dissolved copper is transported with the water until it reaches a new geochemical environment. This new environment could be a location where water chemistry or temperature changes, or where evaporation occurs. If conditions are right, the mineral azurite might form. If these conditions persist for a long time, a significant accumulation of azurite might develop. This has occurred in many parts of the world. Malachite is another copper carbonate mineral that forms under conditions similar to azurite. 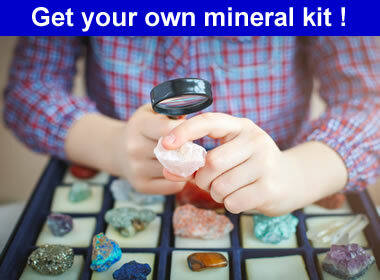 These minerals are often found in the same deposit and are often intergrown with one another. This produces a material known as azurmalachite, which, when of high quality, can be used as a beautiful lapidary material. In the United States, Arizona, New Mexico, and Utah are the notable locations for finding azurite. More important deposits have been found in France and Namibia. Noteworthy occurrences have been found in Mexico, Chile, Australia, Russia, and Morocco. Azurite Nodules in Sandstone: Small azurite nodules about one centimeter in size in a matrix of fine-grained sandstone. From the Nacimiento Mine, New Mexico. Color Deep blue to violet blue; "azure"
Diagnostic Properties Deep blue color, effervescence in dilute HCl, high specific gravity, low hardness. Uses Minor ore of copper, gem material, ornamental stone, pigment. The most diagnostic property of azurite is it distinctive deep blue color. It is also soft with a Mohs hardness of only 3.5 to 4. It contains copper, which gives its blue color and a specific gravity of 3.7 to 3.9, which is exceptionally high for a non-metallic mineral. Azurite is a carbonate mineral and produces a slight effervescence with dilute hydrochloric acid, producing a light blue liquid. Azurite produces a light blue streak on unglazed porcelain. While azurite is not an extremely abundant mineral and is rarely found in large deposits, it has been used in a number of ways. Some of these are explained below. Azurite "Blueberries": Small nodules of azurite, between five and ten millimeters across, that weathered out of a poorly-cemented sandstone near La Sal, Utah. Geologists know that abundant azurite is often found in the rocks above deposits of copper ore. That enables them to use azurite as an indicator mineral in the search for subsurface copper deposits. The presence of abundant azurite indicates the possibility of finding some form of copper ore below, nearby, or up a contemporary or ancient hydraulic gradient. Azurite has been used as an ore of copper metal for thousands of years. The ancient Egyptians mined it on the Sinai Peninsula and smelted it to produce copper. Today, azurite deposits on their own are usually not large enough to be worth opening a copper mine. Where other copper ores are mined, azurite might be removed if it is of adequate grade and easy to mine. Azurmalachite Cabochons: Azurite is frequently associated with malachite, and that association can produce very interesting gem materials. These cabochons were cut from a material known as "azurmalachite" produced at the Morenci Mine in Arizona. They were cut from thin vein material and have a natural wall-rock backing. Both cabs are about 25 millimeters tall. Azurite Granite: A piece of "K2 Granite" or "Azurite Granite," an ornamental stone recently found along the border between China and Pakistan. It performs well as a lapidary material and gemstone. Photographed dry. This piece is about ten centimeters across, and the largest orb is about on centimeters across. Azurite is easy to cut and shape into cabochons, beads, small carvings, and ornaments. It also accepts a bright polish. Unfortunately, azurite has problems that limit its use in jewelry. The greatest concern is the fact that azurite has a Mohs hardness of just 3.5 to 4.0. It also is brittle and can break along cleavage planes. This lack of durability makes it easily damaged if used in a ring, bracelet, or other jewelry item that is subject to abrasion. Azurite also slowly weathers to malachite. This results in a lightening and greening of the gemstone's deep blue color. Store azurite jewelry in darkness, away from heat, and where air circulation is limited. This might be in a closed jewelry box or drawer. Azurite jewelry is difficult to clean. A gentle cleaning with a soft damp cloth or with cool soapy water is best. Abrasive cleaners or excessive cleaning will damage the stone. Ultrasonic and steam cleaning can cause damage. If jewelry containing azurite needs repairs, the repairs should be done in a way that does not heat the stone. Hydroxide minerals are very sensitive to heat. Heating will cause azurite to green or blacken. Azurite is rarely treated to enhance its color. However, it is frequently treated with resins and other substances that impregnate and stabilize the rough. Much of the inexpensive material sold as "azurite" is a composite made of crushed azurite in a binder of resin or other substance. Often, chrysocolla, malachite, or other minerals are blended in. An interesting ornamental stone found near the border between China and Pakistan has recently appeared in the lapidary market. It is a white granite with orbs of bright blue azurite dispersed through the stone. Most people who see it initially think that it is fake, but it can be sawn to reveal round azurite areas inside, and x-ray diffraction reveals azurite. This azurite granite is commonly called "K2 granite" after the second-highest mountain in the world, because the rock was first discovered near the base of the mountain. Azurite Pigment: High-purity azurite finely ground into a powder and ready for use as a pigment. Azurite has been used as a pigment for thousands of years. Today, synthetic pigments are used more than natural pigments. They are lower in cost and standardized in their properties. Making pigment from azurite was costly. During the Middle Ages it was difficult to mine, transportation was slow, and grinding and processing were slow and difficult. Azurite pigment was gradually replaced, starting in the 18th century, when man-made pigments such as "Prussian blue" and "blue verditer" were invented. These synthetic pigments are standardized products with uniform properties. That makes them predictable in their use. They are also less costly to produce. Many paintings done during the Middle Ages, before azurite was replaced with Prussian blue, show deterioration of the blue color. Over time and exposure to the atmosphere and light, azurite slowly weathers to malachite. Much of the blue azurite pigment used during the Middle Ages now shows obvious signs of green malachite as a weathering product. This is another reason why man-made pigments are now used instead of azurite. Azurite pigment and paints are still available today and are easy to find. But they are mainly used by painters who want to employ historical methods in their work. Azurite Crystals: Well-formed crystals of azurite are popular with mineral collectors because of their rarity and beauty. This small cluster of blade-shaped azurite crystals is from the Tsumeb Mine in Namibia. This specimen is small, about 1.4 x 1.4 x 0.4 centimeters in size. Specimen and photo by Arkenstone / www.iRocks.com. Azurite is popular with mineral collectors. They appreciate its deep blue monoclinic crystals, nodular habit with interesting structures, and representative examples of its botryoidal and stalactitic habits. Excellent specimens can sell for hundreds, thousands, or tens of thousands of dollars depending upon their quality and size. The instability of azurite is a problem for collectors. If exposed to heat or high humidity, specimen surfaces will begin to weather to malachite. This causes a dull, faded or greenish appearance depending upon the severity of alteration. Valuable specimens are best stored in closed collection drawers where there is limited air circulation, darkness, and cool, stable temperatures.